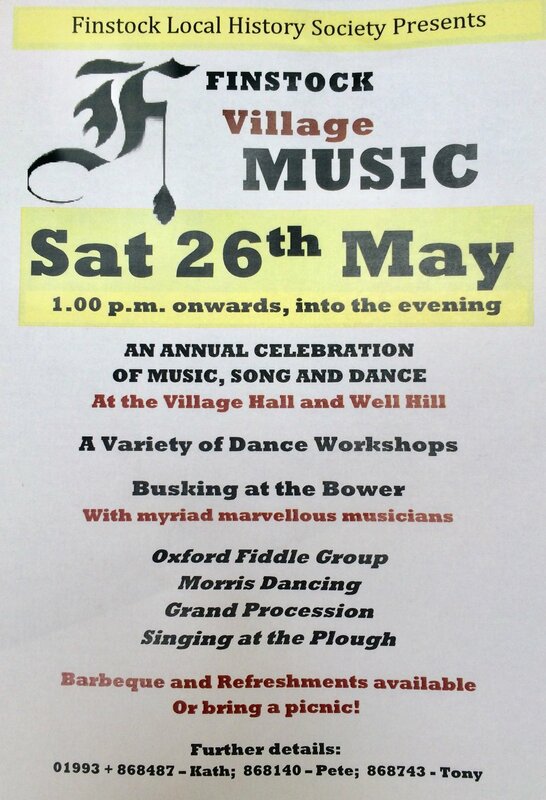 Finstock's annual celebration of folk music, dance and rural life, will have crafts for kids, maypole, morris, dance workshops, procession and family picnic - as well as our real ale bar! Plus our famous BBQ from 1pm. Sit on a bale by the bower and enjoy spots from local musicians; enjoy the view from the Village Hall with some tea and home-made cake; hear talks about local history; grab a pint at The Plough & watch the Morris; try something new at the afternoon folk dance, or get crafty on the village green (or village hall if weather is bad). This year's theme is dance, with opportunities to learn from various traditions: French social, morris, Eastern European Circle Dance, and ceilidh with music from our very own Finstock Festival Band. To help or take part on the day please contact Tony Cooper 868743.